Pigeons understand abstract concepts of time and space, say scientists – FIREPAW, Inc.
New research at the University of Iowa shows that pigeons can discriminate the abstract concepts of space and time — and seem to use a different region of the brain than humans and primates to do so. 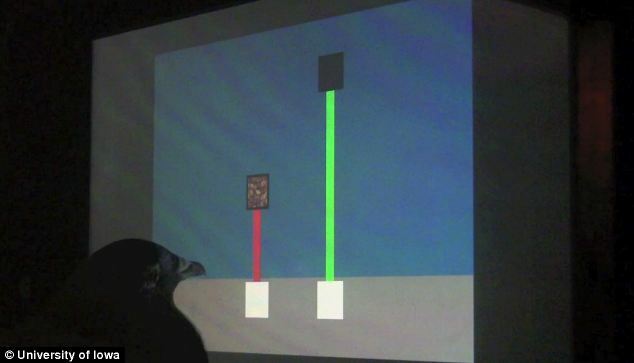 In experiments, pigeons were shown on a computer screen a static horizontal line and had to judge its length or the amount of time it was visible to them. Pigeons judged longer lines to also have longer duration and judged lines longer in duration to also be longer in length. What that means, says Edward Wasserman, Stuit Professor of Experimental Psychology in the Department of Psychological and Brain Sciences at the UI, is pigeons use a common area of the brain to judge space and time, suggesting that these abstract concepts are not processed separately. Similar results have been found with humans and other primates. The finding adds to growing recognition in the scientific community that lower-order animal species — such as birds, reptiles, and fish — are capable of high-level, abstract decision-making. Humans are able to perceive space and time, even without the aid of inventions such as a watch or a ruler. The region of the brain that helps humans make those abstract concepts more tangible is the parietal cortex, part of the cerebral cortex and the outermost layer of the brain. The cerebral cortex is known to be a locus of higher thought processes, including speech and decision-making, and the four lobes that comprise it, including the parietal cortex, process different types of sensory information. But the pigeon brain doesn’t have a parietal cortex, or at least one developed enough to be distinct. So, the birds must employ another area of the brain to discriminate between space and time — or perhaps there’s a common evolutionary mechanism in the central nervous system shared by early primates and birds. Scientists put pigeons through a series of tasks called the “common magnitude” test. Put simply, the birds were shown on a computer screen a horizontal line either 6 cm or 24 cm long for either 2 seconds or 8 seconds. If they correctly reported (by pecking one of four visual symbols) the length or the duration of the line, they received food. The researchers found that the length of the line affected the pigeons’ discrimination of line duration, and the duration of the line affected the pigeons’ discrimination of line length. This interplay of space and time paralleled research done with humans and monkeys and revealed the common neural coding of these two physical dimensions. Researchers previously believed that the parietal cortex was the locus of this interplay. However, because pigeons lack an apparent parietal cortex, the findings suggest this isn’t always the case.